Club Penguin Cheats by Mimo777 Club Penguin Cheats by Mimo777: Mimo's World Famous Rockhopper Comment Tracker! NOW LIVE! i met him now zipline cove, but he left. I've met him 5 times in 2 days! I have never find him and my penguin is 1627 days old! @anonymous: That's not true about the mimo comment tracker! Plenty of people use it! Rockhopper is on Ice Palace at the cove!! Hurry!! 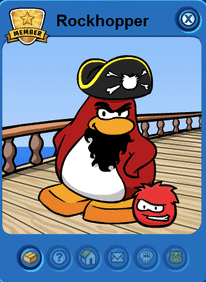 Where Is RockHopper Now ? ROCKHOPPER IS AT YETI AT THE BEACH!!!! HURRY!!!! were is he i cant find him?!! !